Between 1856 to 1860, ten handcart companies entered the valley. It's estimated that 3,000 Saints entered the valley by this mode of transportation. Most built their handcarts and were on their way, however, others like to give their handcart a polished look. 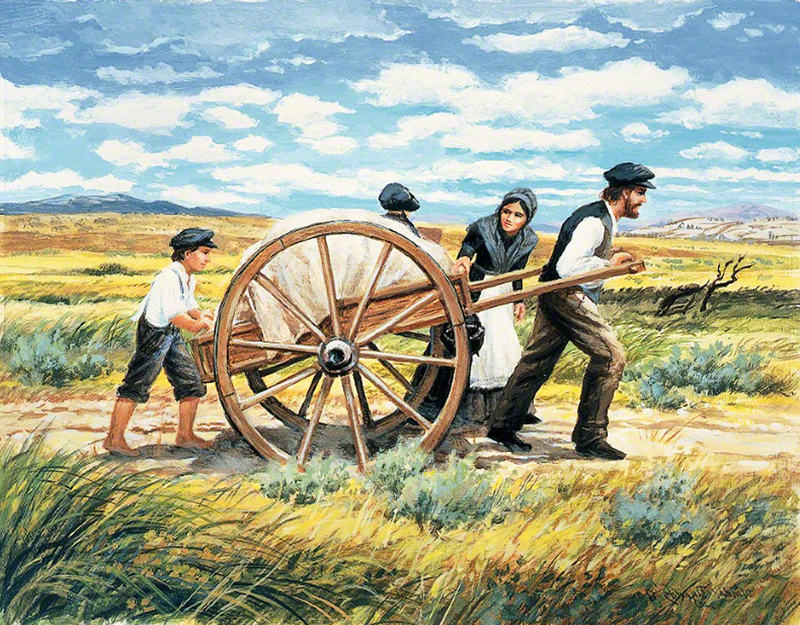 What did some pioneers do to their handcarts to add flare? On March 17, 1842, Joseph Smith organized the Relief Society in Nauvoo, Illinois headed by Emma Hale Smith. The last meeting of the Relief Society took place on March 17, 1844 after which it was disbanded. In 1854, women Formed Relief Societies (sometimes known as Indian Relief Societies) in at least 24 wards as a response to Church leaders’ call to minister to neighboring Indians. They sewed clothing for Indian women and children and assisted the poor. Most of these early societies waned around 1858, due to the disruption of the move south during the Utah War. At the close of 1867, Brigham Young called for the reorganization of Relief Societies in every ward, as he anticipated both a major influx of poor immigrant Saints and the need for women’s support in upholding a self-sufficient Mormon economy. Young appointed Eliza R. Snow to work with Bishops and leading women to establish the Relief Society more widely than previously and, significantly, on a permanent basis. There were at least 102 Relief Societies in operation by 1869. Plewe, Brandon S., et. at., Mapping Mormonism (Provo, Utah: Brigham Young University Press, 2012) 102.